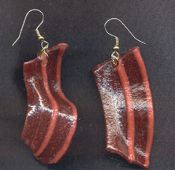 Huge BACON STRIP BEEF JERKY WEIRD EARRINGS - Fast Food Snack Breakfast Meat Funky Costume Jewelry - Big Realistic DIY Food Charm - Each a little different. No two alike. Glossy, varnished poly clay-like charms, each approx. 2" long. Is BigFoot a vegetarian or MEAT-a-tarian?? ?